Suspension training is a good way to develop skills and to develop endurance. Rings are a good way to practice skills like handstands, static holds like the world-famous Iron Cross, and dismounts. Monkey bars are a good way to practice America Ninja Warrior skills and skills that require the user to move her body from point a to point b using only the hands. They are also a good way to doing hanging leg exercises. TRX can be used to perform most anatomical movements using just bodyweight. For example, prone horizontal shoulder adduction plus elbow extension—also called a push-up—can be performed on a TRX. But it will be harder to do because the TRX straps will oscillate constantly. Because they oscillate when in use, TRX straps will make any movement more difficult than usual. TRX straps will force the exerciser to use supporting muscles to keep the body a still as possible. 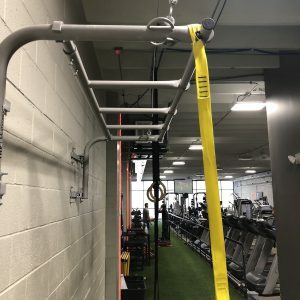 The supporting muscles reflexively counter the direction that the TRX straps want to travel—if the straps move slightly leftward then the supporting muscles contract to move them slightly rightward. But suspension training is a difficult thing to track with precision. How do you measure strength gains in a TRX push up? You could track the number of reps performed over time. But would an increase in that number show improved strength or improved endurance? If you climb across monkey bars, you could track the time that it takes to make a pass. But does a reduction in that time show improved strength, or does it just show improved speed? 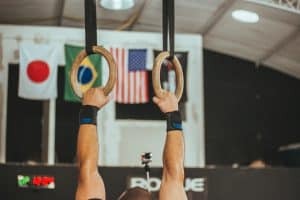 If you eventually learn how to do a static hold—like a front lever—on the rings, did you get stronger or did you improve your coordination? For all of those reasons, if you want clearer proof that you are getting stronger, weightlifting exercise may be the way that you have to go. If you do some exercise, like a seated chest press, during which a weight has moved some distance, and the weight gets heavier over time, that is a clear sign that you are stronger. Suspension training and weight training can produce results–if you know what you’re doing. If you’re not seeing the desired results, that may be a sign that you should do some one-to-one training with a personal trainer that you trust. ← Can you gain muscle while losing weight?